The days of having your entire team together under one roof are rapidly diminishing as more and more businesses find themselves accommodating not only employees, but also contractors and freelancers who work remotely. Many smaller businesses are saving on overhead and operating costs by operating entirely with a remote staff. While remote working carries a lot of benefits, it also comes with its own set of challenges. One of the biggest? Effective communication between management and team members, especially when simply piling everyone into a conference room on a regular basis is not an option. One of the biggest obstacles to effective communication between remote team members is not having access to the right communication tools. Many businesses rely on their team members' own personal equipment, such as cell phones and e-mail, to stay in touch, especially when it comes to working with contractors. Although there are apps and online tools available to make such a system workable, remote workers miss out on many of the benefits offered by office PBX phone systems. Another problem with this kind of setup is that there are many ways to reach each team member. Having to keep track of land line numbers, cell phone numbers, e-mail addresses and various user IDs for each team member is confusing at best; plus, different methods have different degrees of reliability for each team member. One way to overcome this challenge is by giving each team member access to a centralized office phone system. Cloud-hosted business phone systems offer all of the benefits of a traditional PBX system, with call routing, ring extensions, and conferencing capabilities, with the added benefit of providing each remote team member a single company contact number that can be integrated with their personal mobile devices. Next step: Contact Nexogy and learn all about cloud-hosted business phone systems for communicating with your remote workforce. It's important to touch base regularly with remote team members to make sure everyone understands not only what their responsibilities are, but also, the expectations of both managers and clients regarding work schedules, deadlines, project deliverables, etc. Conferencing technology is key to ensure everyone understands their part in a process and in keeping things on track. Whether you choose to teleconference, video conference or to utilize an online chat system, there are plenty of online tools available, both free and paid, that can bring the entire team together in real time. 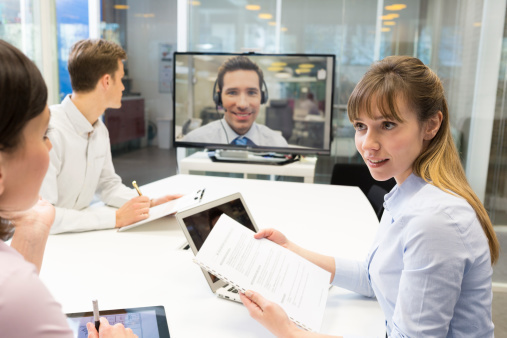 Many cloud-hosted company phone systems offer the added benefit of built-in videoconferencing, allowing remote team members with web cams an opportunity to see each other face to face instead of trying to form a working relationship with a disembodied voice or a screen name and avatar. Cloud-hosted videoconferencing also tends to be more reliable than many free options, such as Skype or Google Hangouts. Great technology is just the beginning of good communication among your remote workforce. It's also important to develop excellent listening skills, and to foster an environment where team members feel free to discuss concerns and share ideas without fear. But without the right tools for staying in touch, your remote team won't have the necessary foundation on which to build an effective communication strategy.